This company was created so that I could carve a place for myself in the world. A place to design, to dream, and do good. I was born and raised in New York. After I got my degree in illustration from the Rhode Island School of Design, I went back home to NY to figure out the rest of my life. I had really high hopes for my exciting new career as an illustrator but things didn't unfold the way I thought it would. After a few starts and stops, I interviewed for a tiny, bottom of the totem pole type of job at a licensing company in NYC. I had no idea that I was about to discover a new passion and a whole new career direction. Because that job? It was right next door to a jewelry supply store. "If I can give one bit of advice to any drama major, high school theater kid, or inmate who is reading this in a prison library with dreams of being cast in the prison play, it's this: write your own part. It is the only way I've gotten anywhere. It is much harder work, but sometimes you have to take destiny into your own hands. It forces you to think about what your strengths really are, and once you find them, you can showcase them, and no one can stop you." In 2006, I created Prismera Design as brand to represent my jewelry designs. I have been so grateful to have had the work featured in Glamour, Lucky Magazine, and Daily Candy, as well as international publications like ELLE Quebec and Australia's Wedding Style Guide. I've also had the opportunity to design exclusive work for Anthropologie, EXPRESS, and Maurice's. Prismera Design has been featured and sold in boutiques, museum stores, and other retail locations across the US. 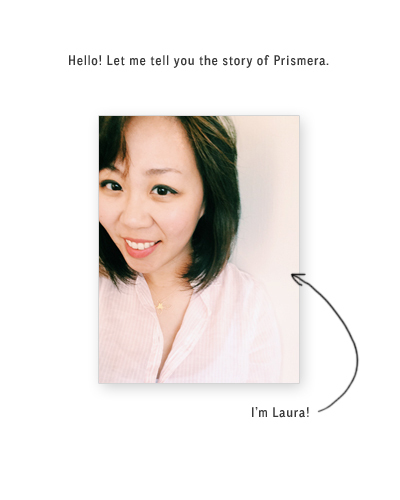 After several years of being headquartered in New York, I headed to the San Francisco Bay area, where Prismera now calls home. The designs that I create are informed by all the places I've been and my personal journey. And it's been a beautiful journey. Thank you so much for viewing my work and for supporting independent design. I hope you enjoy my designs as much as I've loved creating them for you!